Anyone with koi and other pond fish knows that they aren’t generally picky eaters. As soon as the ice melts they flock to the surface, looking ravenous after the long winter. But just because they will eat doesn’t mean that it should be fed or be fed what you are feeding. Unless you live in a temperate area or you keep your pond heated during cold months (above 50F) it is vital to their health and appearance that they be provided with appropriate nutrition for each season. Commercial food formulas are developed with seasonal changes in growth, metabolism and other biological activities in mind. Lots of things go on in the body of a pond fish as the seasons change – all of which have to be considered when you purchase food. In the Spring, everything awakens. Bugs and trees, flowers and seeds and your fish! After several months of relative dormancy, your fish are back to the surface, looking for anything they can eat. But spring temperatures can be fickle. Your fish may seem ready to go, but their metabolic rates are just kicking back into gear, and they may not be able to process the materials in some food formulas efficiently. During these early Spring months it’s important to provide the fish with an easy to digest formula. When the fish are ready to eat, feed these formulas when water temperatures reach between 40 F and 45 F and until they stay steadily above 50 F. Being cold-blooded, the body temperature of koi and other fish fluctuates with the water temperature. The cooler the water, the slower the fish is able to digest food. Proteins are not as easily processed by the fish during this period, and can cause internal health issues if they remain too long in the digestive system. Spring and Fall Pond Food Formulas are made to help your fish digest quickly and easily by containing less protein and more digestible materials like wheat germ. These formulas give your fish the energy they’re seeking as they come out of dormancy. When the temperatures fall again as winter approaches, use a pond thermometer to gauge when to make the switch back to Spring and Fall formulas from the higher protein foods (staple/growth). As the water cools, fish may become less active and will spend more time near the bottom of the pond where they will spend the winter months. When water temperatures dip below 40 F, stop feeding until Spring rolls around again. Summer is the most active time for your fish. In these few short months they grow faster, eat more, breed, spawn, and develop rich coloration under the stronger sunlight. As the water temperatures rise (steadily above 50 F) and the fish become more active, the shift to higher protein growth and staple formulas can and should be made. Higher protein content formulas are essential for the season. The protein is necessary for growth, immunity to disease and parasites, repair of damaged tissues, and reproduction. Young fish put a lot of energy into growth, often gaining several inches of length in a season. Even at maturity, koi will continue to grow, but the growth slows as the sexually mature fish concentrate their energy into spawning and egg production. Growth and Staple formulas will have higher protein content (35-45 percent) to aid the fish in these activities. These formulas also contain plenty of vitamins and minerals to keep them happy and healthy. Color enhancing formulas contain added algae, usually spirulina, to increase the vibrant yellows and reds these fish are prized for. During the summer your fish can enjoy staple foods and a variety of treats that will encourage growth, color and overall health. The quality of the foods is more even more crucial than the amounts you feed – overfeeding can lead to poor water quality and poor water quality can have negative effects on color, health and vitality of your precious fish. It can be hard to ignore you fish when they appear to be begging for a handful of food during cold seasons. Keep in mind that besides the possibility of the fish developing internal complications from slower digestion, the water quality of the pond can decline rapidly if the fish are fed regularly. Most of us shut down filtration and other equipment for the winter to prevent damage from icing and snow. The water your fish are in when you shut down the equipment is the water they will have to live in all winter, less circulation, no filtration except for biological processes that continue, and no real water changes to keep the water clean. 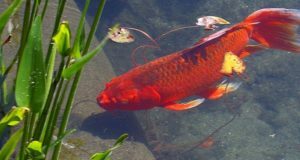 Feeding the right diet is key to the health, vitality and vibrancy of your ornamental pond fish. Formulated foods take the guess work out of the equation and make it an easy thing to do! During the Summer in addition to feeding staple pellet, consider treating your fish to a variety of fresh foods as treats, too. Offer small bites of fresh fruit, veggies, leafy greens and even proteins like bits of shrimp or squid. These items (or commercial treats) are a great way to supplement your fish with nutrients and vitamins. It will entice them to the suface to feed out of your hand (which is not only fun, but it allows you to inspect the fish for signs of disease or parasitic infection). Some favorites include melon, cucumber, peas, lettuce, anacharis and grapes; just remember that like all foods they should be fed in moderation to prevent water quality issues. If you have any questions or observations on feeding koi and pond fish, please feel free to write in on the comments section. Or should I say knowledge, my nishikigoi are doing great! !